Help us defeat dementia in Down’s syndrome! Welcome to the Defeat Dementia in Down’s syndrome website. Here you can find some information about the research we are doing at the University of Cambridge to understand the links between Down’s syndrome and Alzheimer’s disease. You can use the tabs on the left of this page to explore the studies we are doing to achieve this, which use brain scans, eye scans, and EEG. You can also watch some films about the work we are doing. 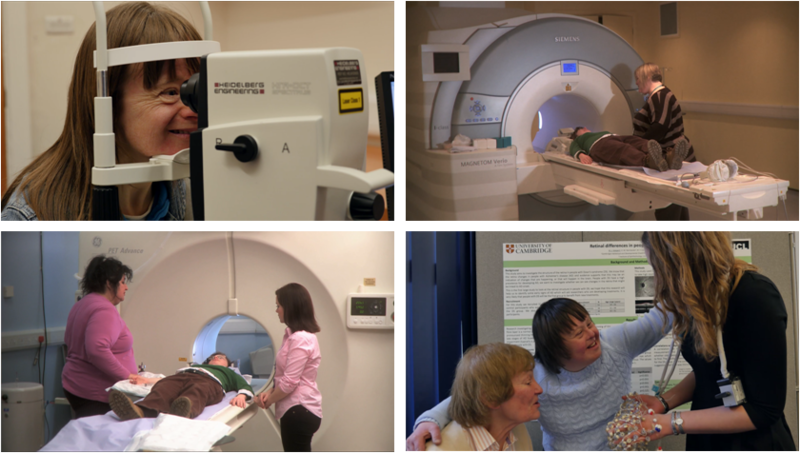 Our film ‘Together’ shows how we are working alongside people with Down’s syndrome to do this research, while the film ‘Defeat Dementia in Down’s Syndrome’ shows what it is like to have a brain scan. If you would like any information about our studies that you cannot find here, or if you would like to find out how you can get involved in the research, please send an email to dh-admin@medschl.cam.ac.uk. Follow this link for Glenn’s story. One of our participants explains to the DSA Journal what it is like to take part in research. Our long term objective is to understand why people with Down’s syndrome are at risk for Alzheimer’s disease so that safe treatments can be developed. We hope that our research will inform a clinical trial, so that scientists can find a drug to prevent this type of dementia from developing in people with Down’s syndrome, and in the general population. We have received a generous amount of funding from many organisations, including the Medical Research Council, the Down’s Syndrome Association, Alzheimer’s Research UK, The National Institutes of Health, the Health Foundation, the Stevenage Bioscience Catalyst, the Bailey Thomas Charitable Fund, the Cambridge Biomedical Research Centre, and the Addenbrooke’s Charitable Trust. We are especially grateful to the DSA and HFT for their support, and for helping us spread the word about our studies via their organisations and newsletters.